My10yearPlan.com® is not a canned, one-size-fits-all experience where the learner has little control over the outcome. Instead, My10yearPlan.com® enhances the textbook experience, giving the computer a role beyond that of "tool" to something more akin to coach, counselor, or mentor. The system gently guides, prompts, and, where necessary, prods the learner through an ageless, in-depth decision-making process. The result is a quantitative 10-year career, education, and life plan that has personal relevance for the learner. Users can then share their plans with advisors, counselors, instructors, mentors, family, and friends, generating support as they work toward their dreams, goals, and plans. 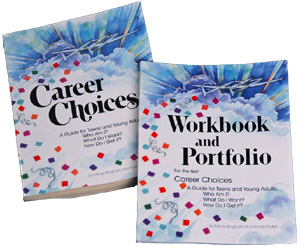 The cornerstone of the Career Choices series is the development of a personalized 10-year plan. We help students become career-focused while learning how to make informed decisions about their futures. Crucial to the effectiveness of My10yearPlan.com® is the interactive process taught by the Career Choices series. Get started today by setting up your school's access to the Career Choices series module My10YearPlan.com®. We think questions are a very good thing. Check out some of the most frequently asked questions by My10yearPlan.com® members. Check out our training videos and other great support resources for students, educators, and parents.